Apple Inc saw its stock rapidly fall 9 percent today after a rumour was started that CEO Steve Jobs had been rushed to hospital after a major heart attack. The story was first published by a citizen journalist on CNN’s site iReport. 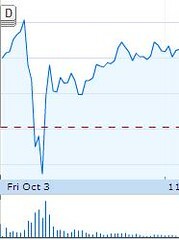 Fortunately Apple were able to quickly dismiss the story as nonsense, but the rumours had already had a negative effect on Apple’s stock, which after the rebuttal climbed up again. We don’t know it this was a deliberate attempt to manipulate Apple’s stock or someone who was just pulling a prank on CNN and/or Apple. But it illustrates clearly how an anonymous person can have a huge impact on several brands by just posting a few lines of lies on a web site. And for a trusted brand like CNN it is of course troublesome to be hosting such content. Silicon Alley Insider writes that “Citizen journalism apparently just failed its first significant test”. Skeptics of user generated content are of course gloating now. At least, crisis consultants will not be out of work in the near future. Tags: steve jobs, apple, apple, aktier. Ping.